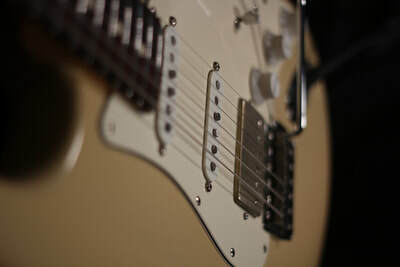 My main guitar is a 2002 Fender USA Stratocaster, in Transparent Honey Blonde finish. 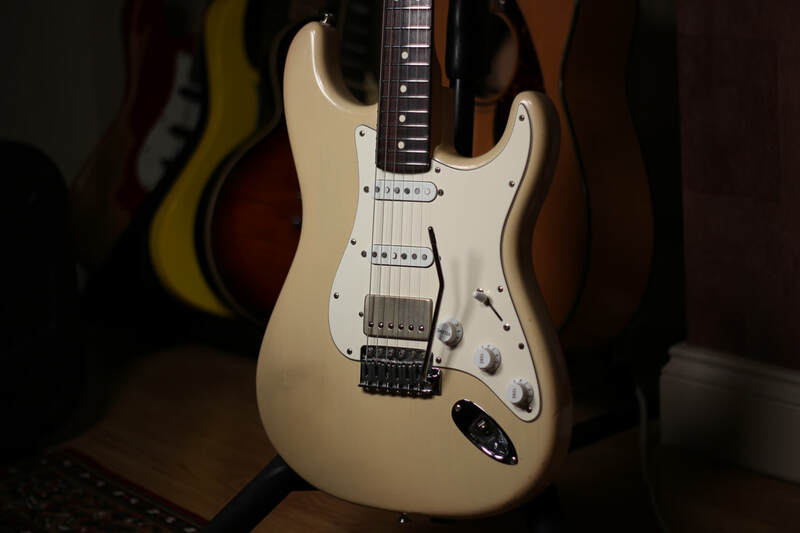 When I purchased this guitar in 2015 it was a completely stock SSS model. I have since made several modifications to the tremolo, pickups, electronics and tuners. 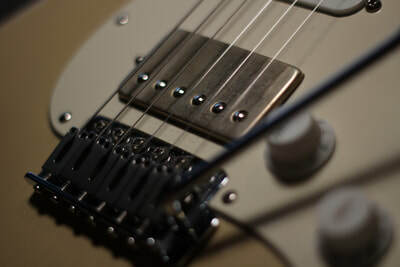 I replaced the stock tremolo with a Wilkinson tremolo with solid steel sustain block. 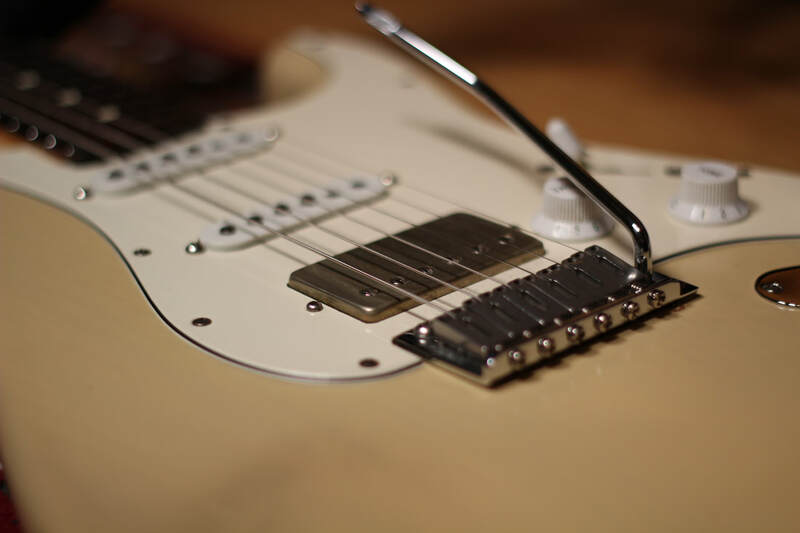 The base plate is from the vintage style Wilkinson trem, and the saddles are from the modern style Wilkinson trem. 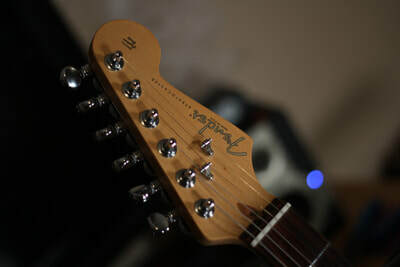 Switching to the Wilkinson tremolo also allowed me to change from the standard Fender vintage string spacing, to modern string spacing. I have the tremolo set up with three springs in the back and have it floating slightly - enough to raise the pitch a semi-tone with the bar. I swapped out the Fender single coil pickups for a HSS set from Bare Knuckle Pickups. The VHII Humbucker in the bridge is perfect for rock and lead tones, with it's classic, vintage hot voicing. 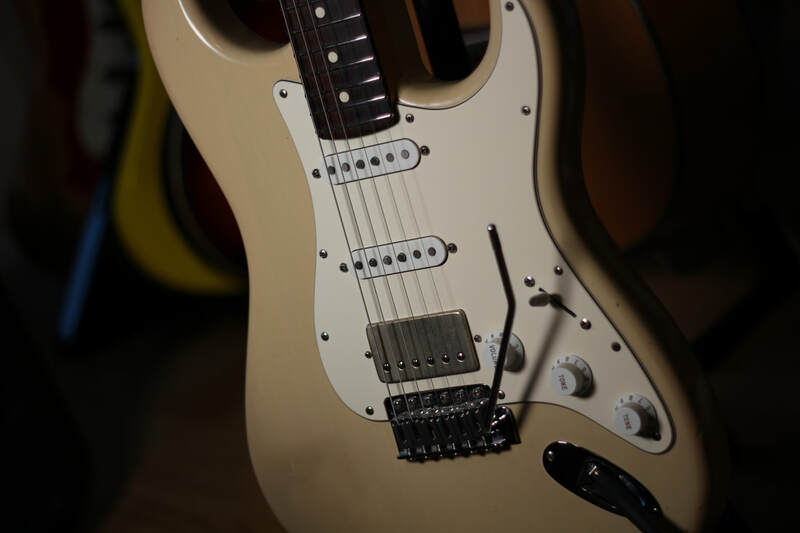 The '63 Pat Pend Veneer Board single coils in the middle and neck positions provide incredible clean and edge of break up tones, but also handle higher gain tones outstandingly well. 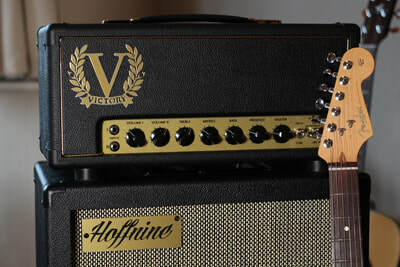 Some of my main influences range from SRV, John Mayer, and Eric Clapton, through to Van Halen, Led Zeppelin, and Iron Maiden, and on to guitarists such as Joe Satriani and Steve Vai, and it's great to be able to achieve all of those kinds of tones with this guitar. 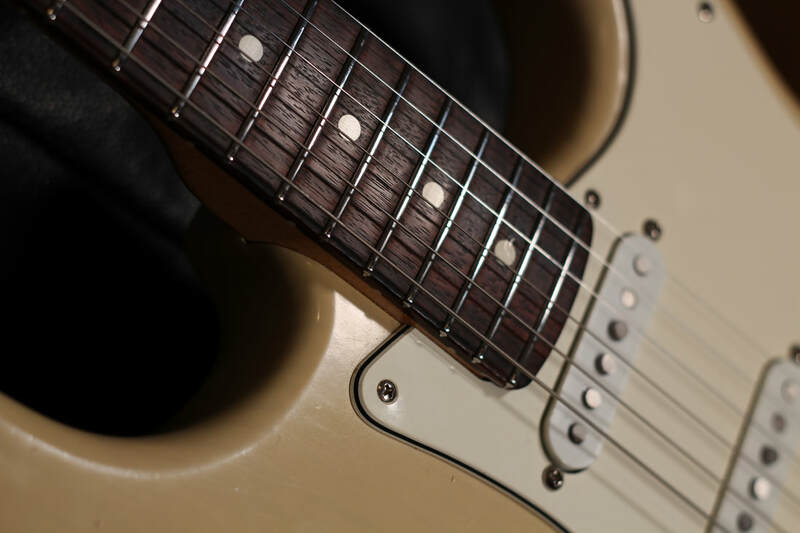 I originally swapped the Fender tuners for a set of Grovers, but after a year decided to upgrade again to a set of Kluson Vintage Style Locking tuners. These work great and reduce re-stringing times massively, and they look cool too! Perhaps one of the biggest upgrades has been the stainless steel refret, carried out by Jaydee Guitars in Birmingham, UK. After two years of solid playing, the original frets had begun to wear down a considerable amount, so I had the guys over at Jaydee Guitars refret the neck with medium jumbo stainless steel frets. They also put on a new bone nut. The guitar plays like an absolute dream, and the steel frets are silky smooth! 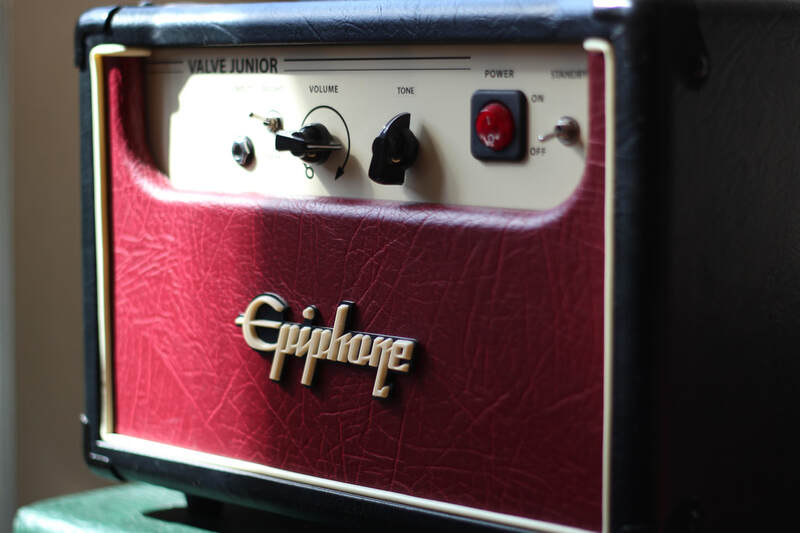 The electronics include CTS 500k pots, an Oak Grigsby 5-way selector switch, and a Bare Knuckle Pickups PIO tone capacitor. 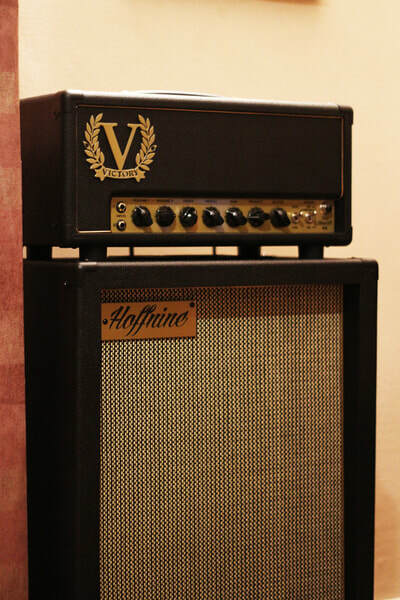 My main amplifier is a Victory Sheriff 44. 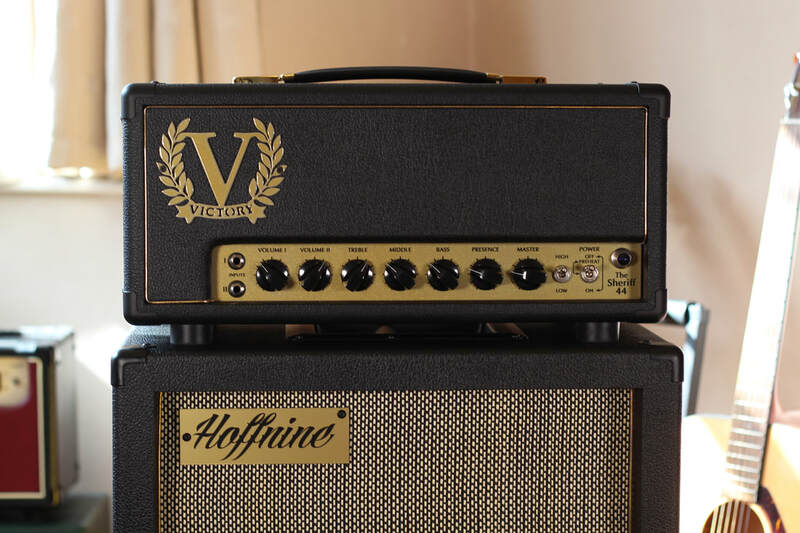 My first experience with Victory amps was with a friend's Victory V30, and I knew I would soon have to get one for myself. 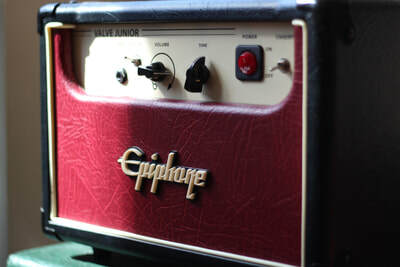 Being a fan of classic British style amplifiers, I was drawn towards the compact Sheriff 22. I used a Sheriff 22 for just over a year, before finally upgrading to the bigger Sheriff 44 after some discussion with Martin Kidd. 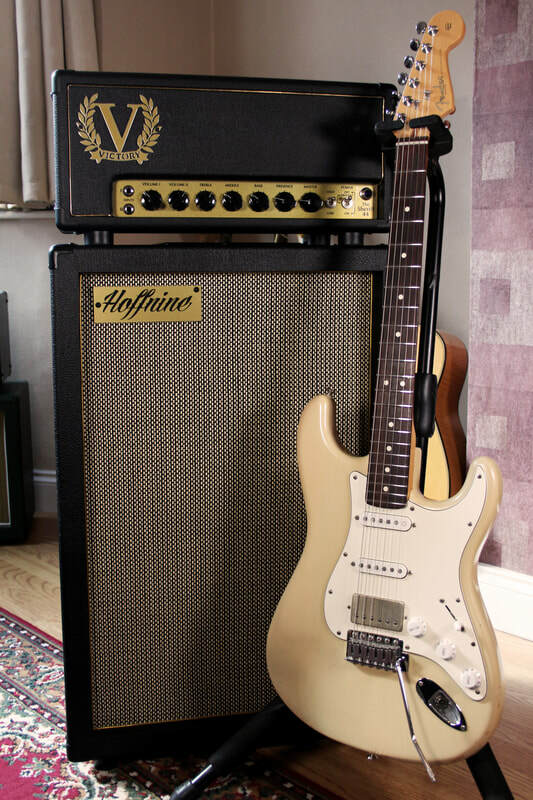 The Sheriff delivers outstanding British tones, from crunchy plexi style tones through to more saturated 80s British style tones. The cleans on this amp are also absolutely stunning, particularly with the single coils on my strat! The amp has a tonne of headroom available, and takes overdrive and fuzz pedals really well. 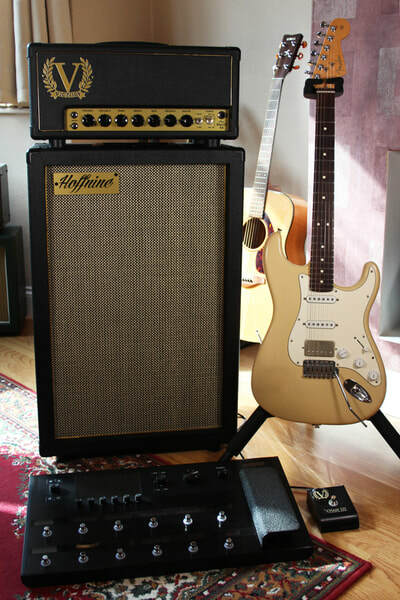 I like stacking Tube Screamer and Klon style pedals in particular with the Sheriff. 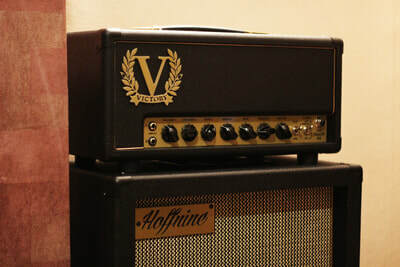 You can check out more from Victory at www.victoryamps.com . Not long after purchasing the Victory Sheriff 44, I realised I needed a great cab to go with it. I reached out to Tom Mulraney over at Hoffnine cabs, and with his help, decided on the specification for a custom vertical 2x12 cab. 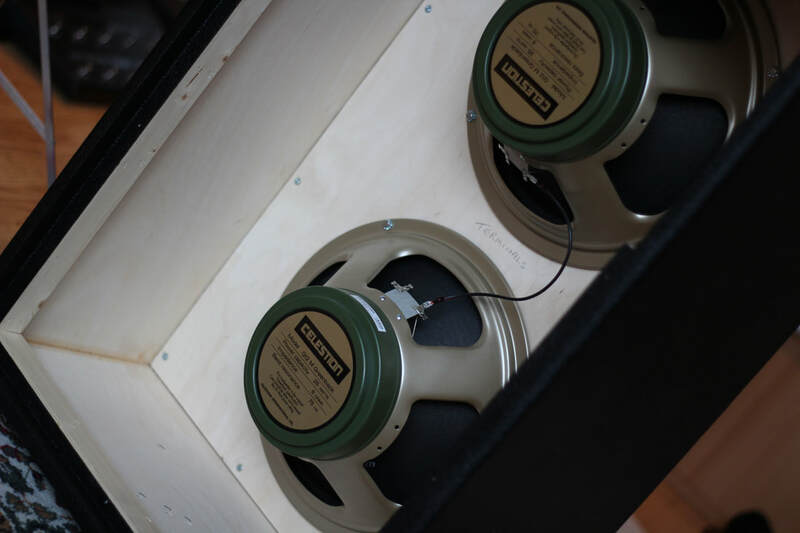 The cab is constructed of 18mm baltic birch plywood, and covered in levant black tolex. It features an aged salt 'n' pepper grille cloth, gold piping, gold badge, and an angled speaker baffle. 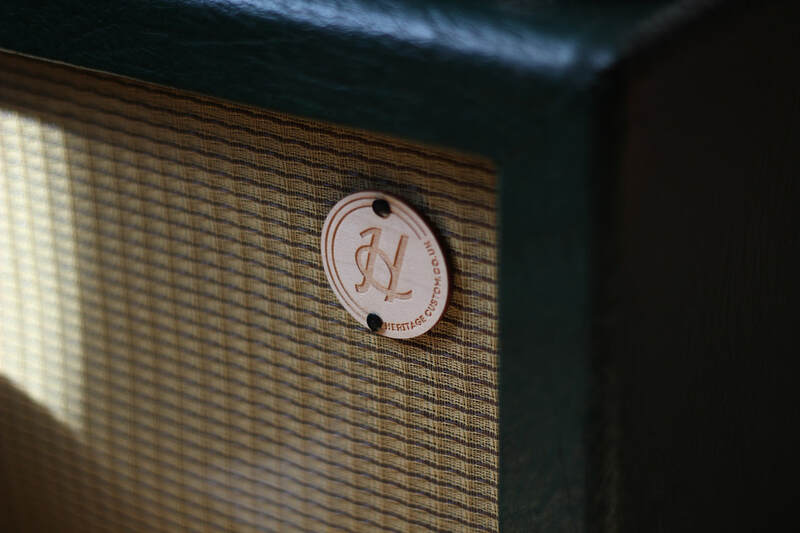 A single recessed handle is located on top of the cab. 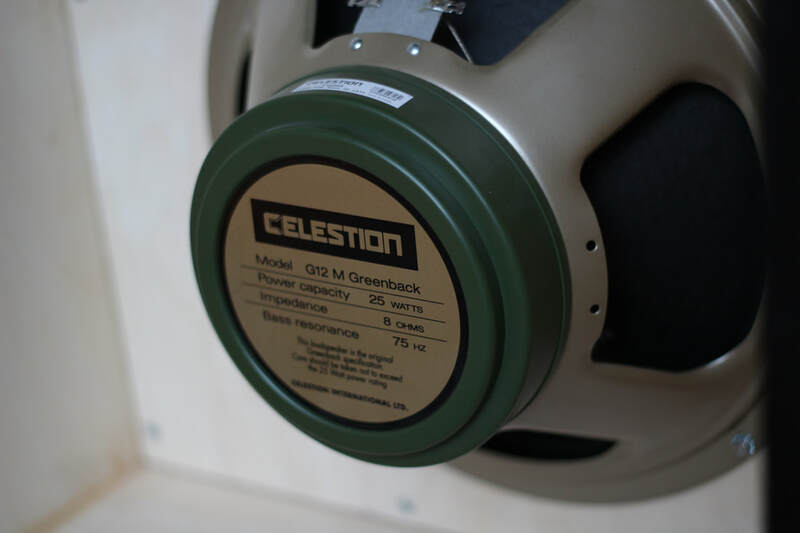 The cab is closed back, and loaded with two Celestion Greenback G12M25 speakers. 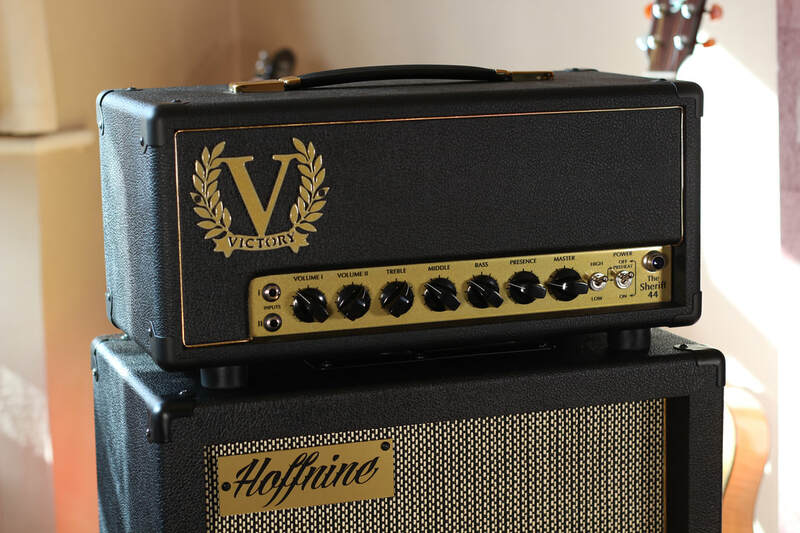 It is the perfect match for the Victory Sheriff 44, and gives a huge but well balanced sound. 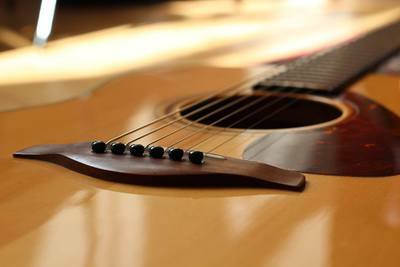 I've tried many different guitar picks over all the years I've been playing guitar. I eventually settled on Jazz III style picks, but something was still missing from what was my idea of the perfect pick. Somewhere along my search for the ultimate pick, I came across Winspear picks. I got in touch with Tom Winspear and we began discussing options and possibilities for different materials and sizes. We narrowed down the specs, and Tom sent me a selection of a few different picks to try out. I tried them all, but one stood out in particular. My Winspear picks are based on Winspear's Shiv pick - a Jazz III style pick but slightly more square and marginally wider at the top, with a sharper point at the tip. The pick felt perfect in my hand. The real game changer, though, was the tapered thickness, from 2mm at the top, to 1mm at the tip. 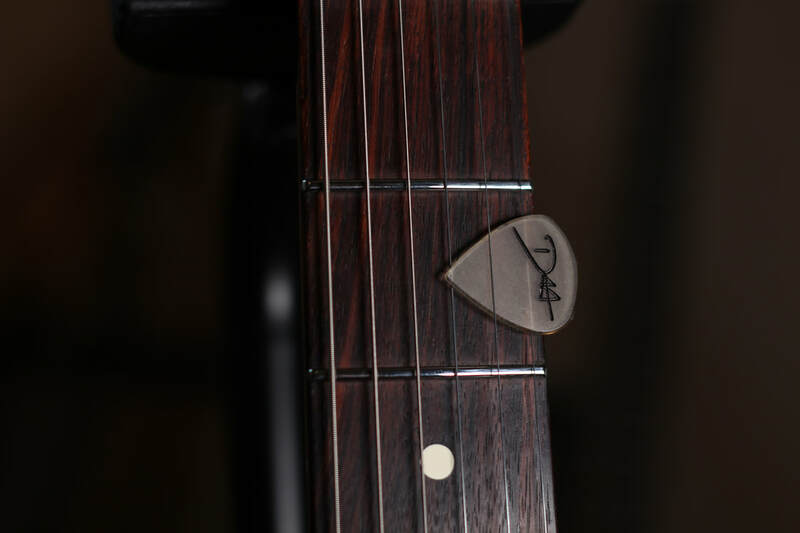 This pick feels incredible and glides through the strings with ease when picking, but also doesn't feel too bulky due to the tapered thickness - which also allows for really expressive picking. The smaller size of the pick also means I can easily tuck it between my fingers when switching between the pick and fingerpicking. The picks are expertly crafted from Ultem, with my logo etched in on one side which provides extra grip to the already grippy material! 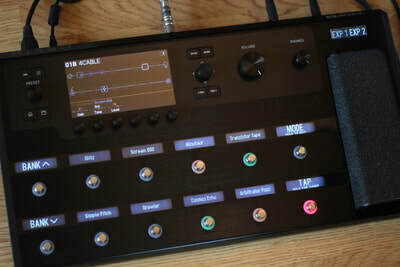 I've been using the Line 6 Helix since it's release in 2015. 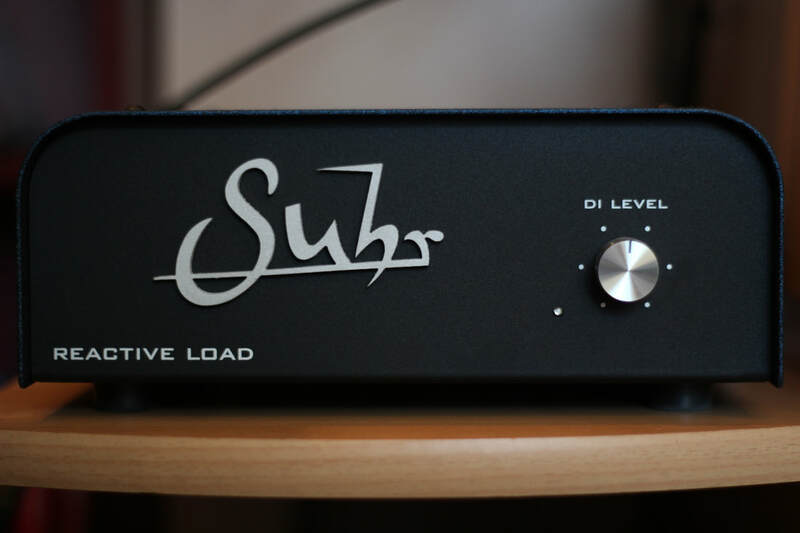 The Helix is one of the most versatile pieces of equipments I've ever used and has proven invaluable to me - becoming a key component of my rig. One of the main ways I use the Helix is in the 4-Cable Method with my Victory Sheriff 44. I find the effects to be outstanding quality and the various switching options and snapshots make it incredibly easy to switch between different tones depending on what's required. I also use the Helix for pretty much all of my recording. 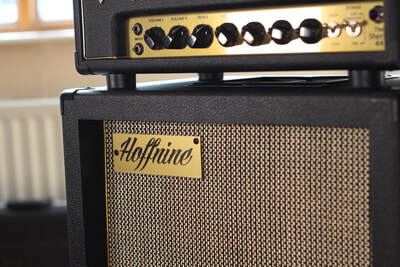 The vast array of amp and effect models means I can get any tone I need for any session. I also find the Helix's cab sims to be incredible, and use them often, in conjunction with the Suhr Reactive Load, when recording my Victory Sheriff 44 and other valve amplifiers.